Tweedily dee, tweedily do, where in the world did this month go? 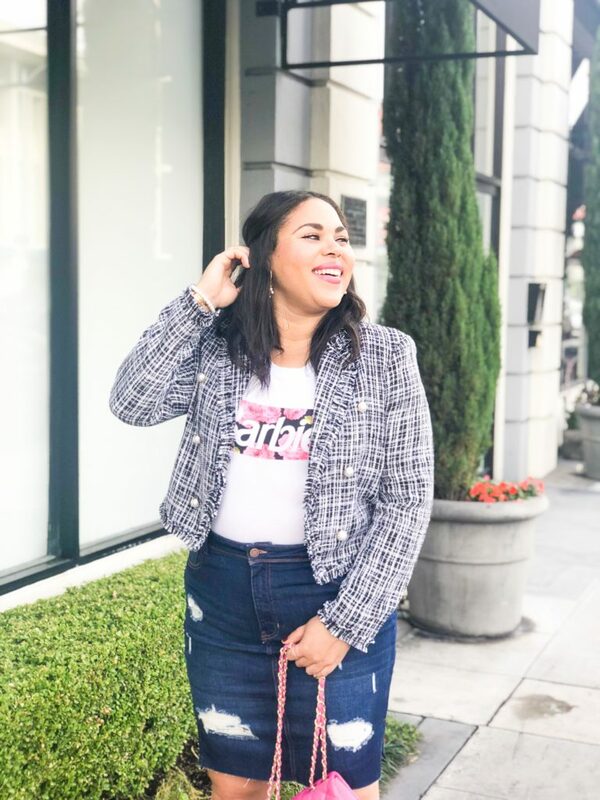 We are full-on into fall now (see you soon, Halloween), so today I wanted to share a fun fall outfit idea and show you how to style a tweed blazer. 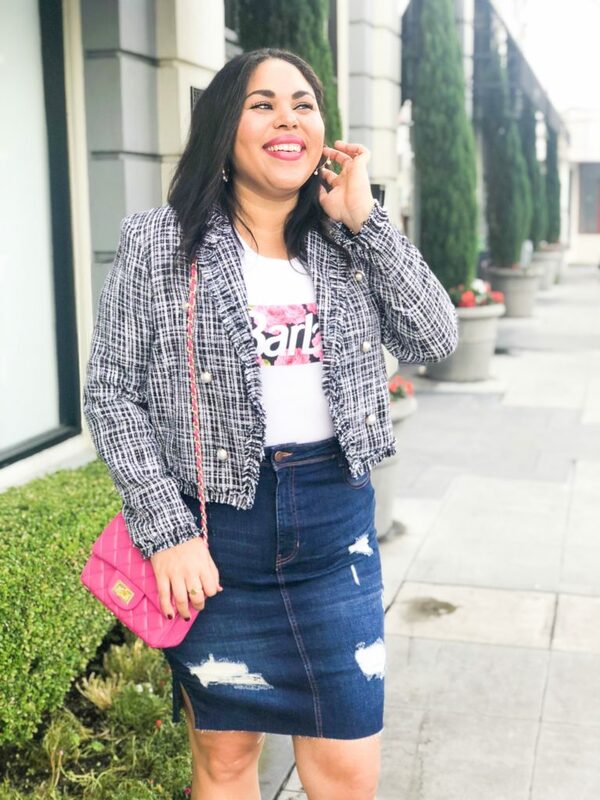 Tweed is a rough, woven fabric that typically has a mix of flecked colors, and is spun into a weave, twill or herringbone structure. It’s originally from Scotland and is commonly used to make blazers, jackets and skirts. It’s sometimes referred to as “grandma,” fabric, but I’m into it! 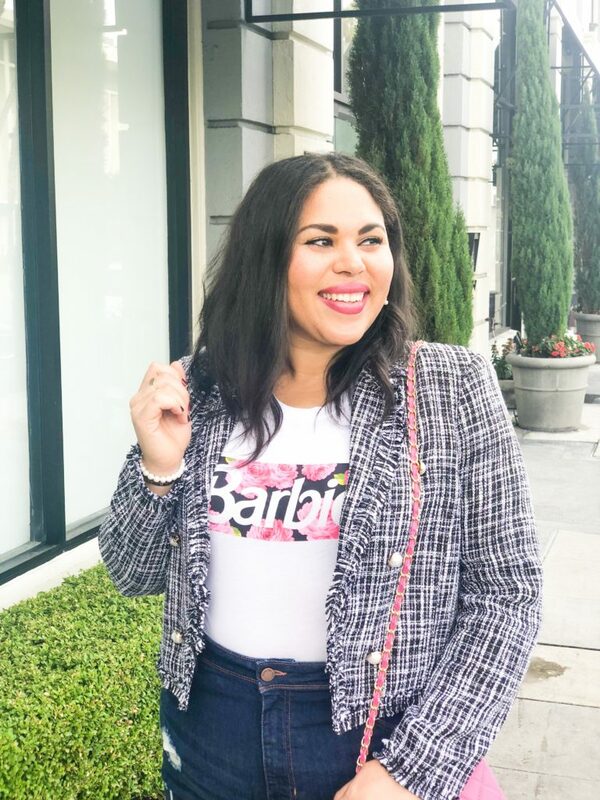 Tweed blazers are very “in” this year, so when I found this one on sale for less than $40, I had to have it! I love the shoulder pads, frayed edges, metallic flecks, and gorgeous pearl details. It’s not cropped, but it’s on the shorter side, so I knew I wanted to style it with a high waisted bottom. 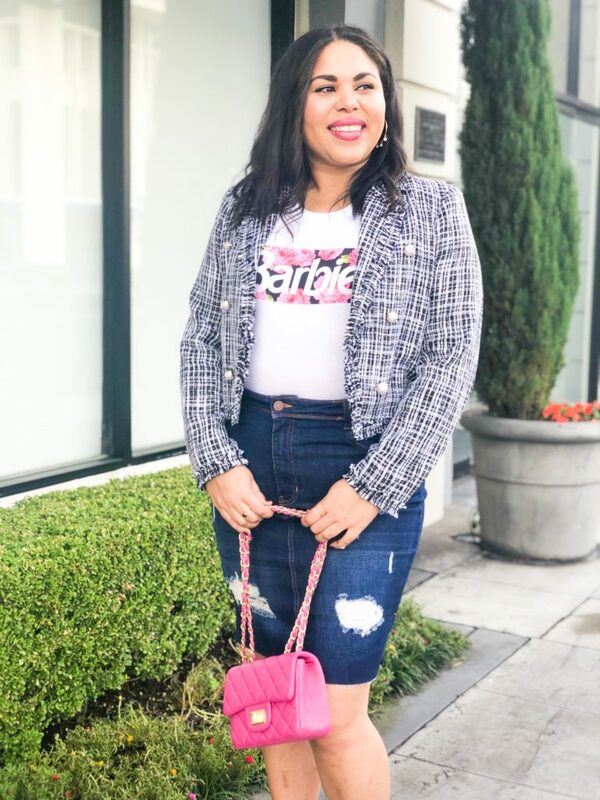 I recently got this high waisted denim skirt from Amazon (which I absolutely love! ), so I wore it with my tweed blazer for a feminine and chic look. 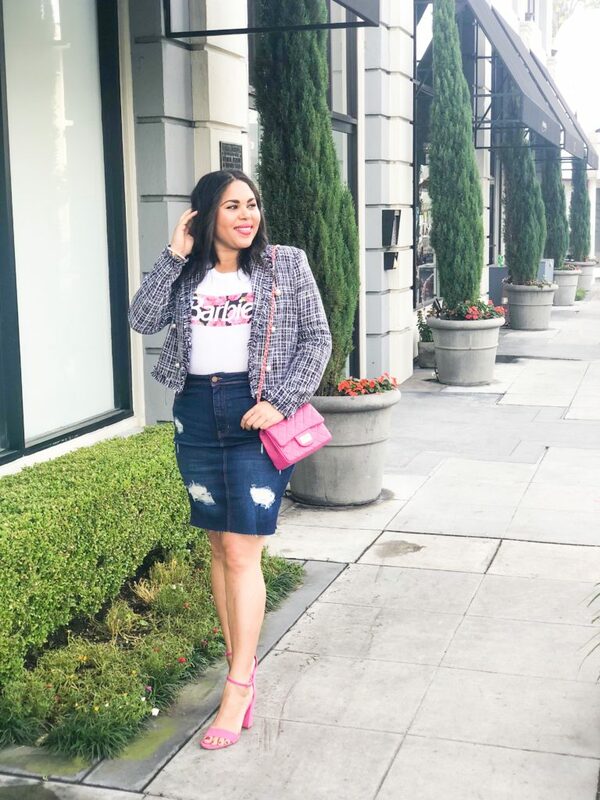 I also wanted to incorporate my favorite pink heels, so I needed a pop of pink somewhere else in the outfit to tie it all together. 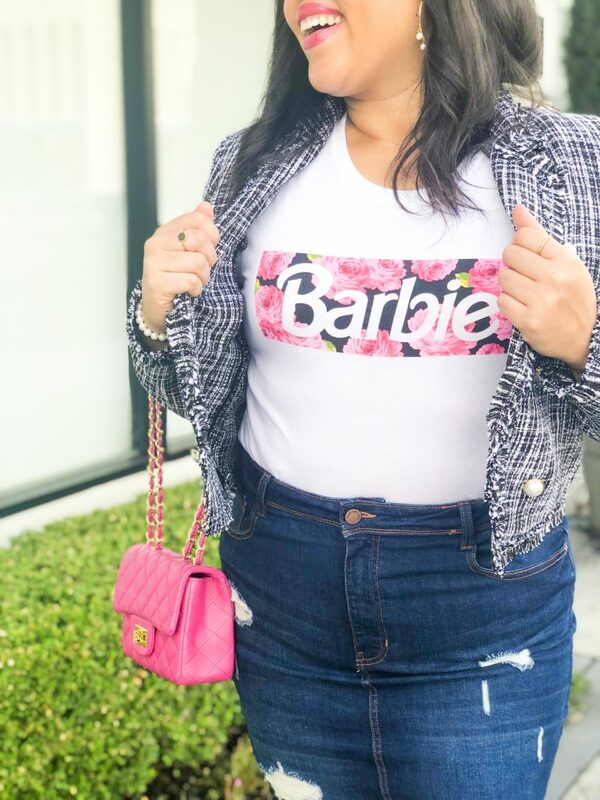 This fun Barbie t-shirt was the perfect match! 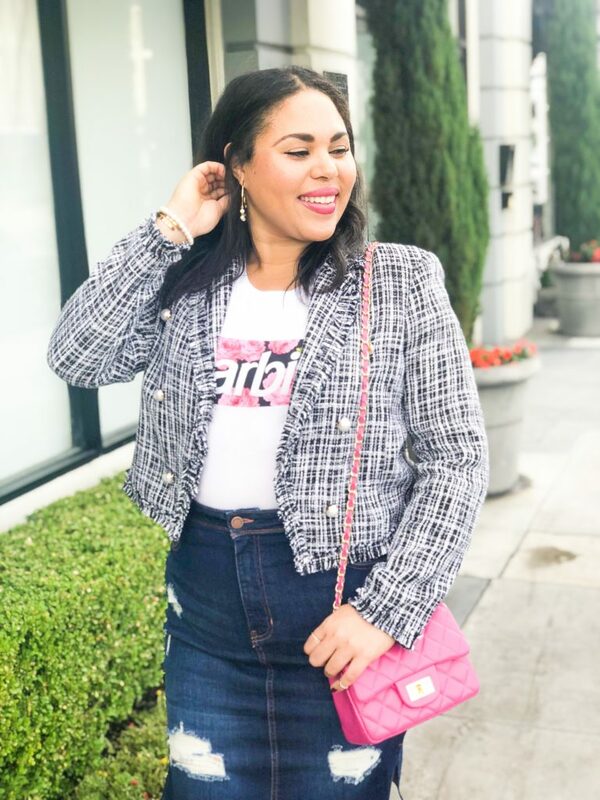 This tweed blazer is so versatile and the styling possibilities are endless. 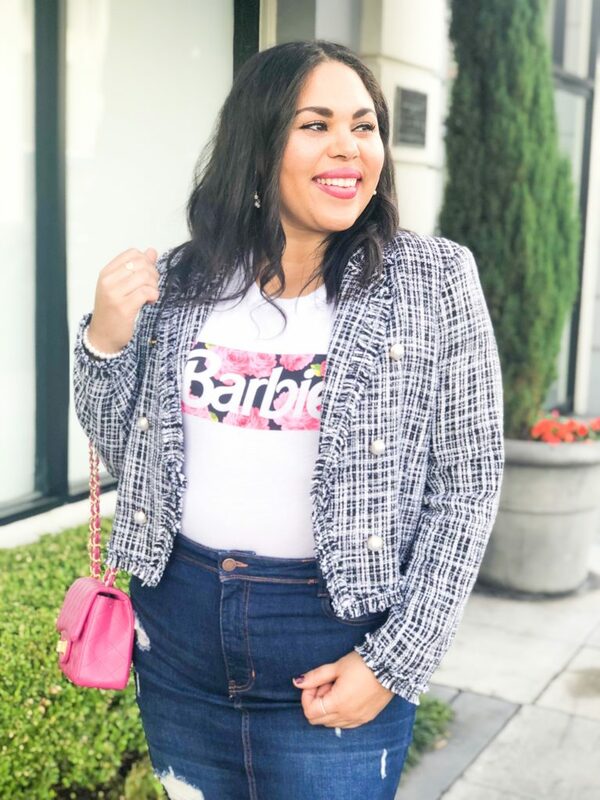 Wear over a bodysuit and high waisted jeans with your favorite strappy sandals for date night, or with your favorite sleeveless dress and pumps for a work-appropriate look. 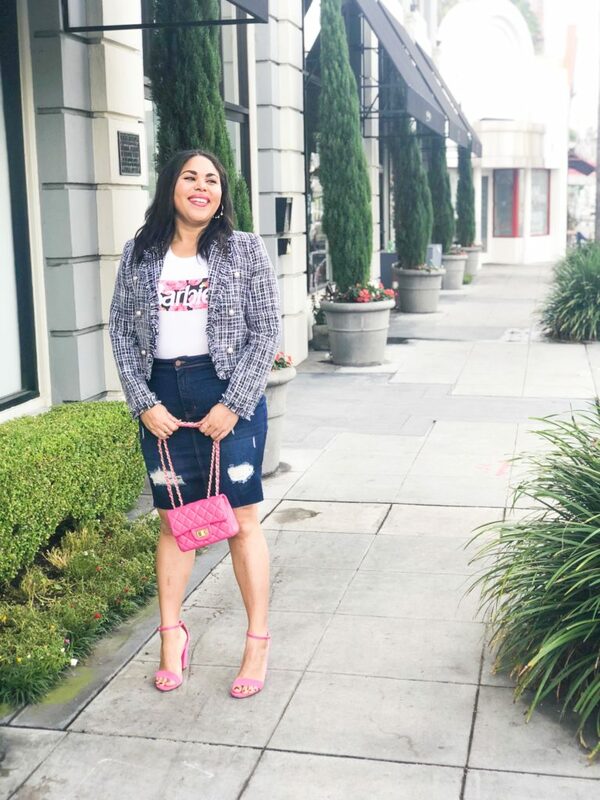 Whichever style you decide on, you’re going to look so chic! 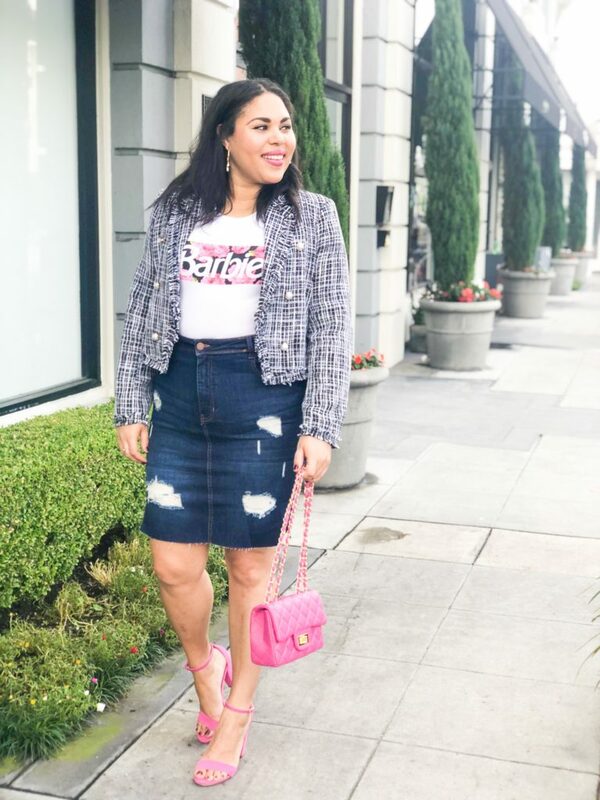 I am wearing a size L blazer, XL in the skirt (very stretchy, but it’s juniors sizing so size up) and XL in the cropped Barbie t-shirt. 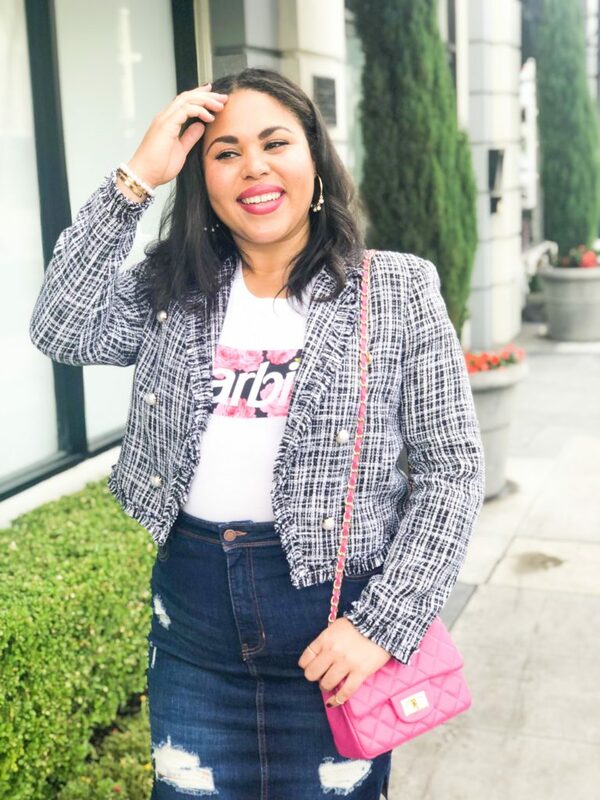 The blazer is true to size, but is a tiny bit snug when you first put it on. 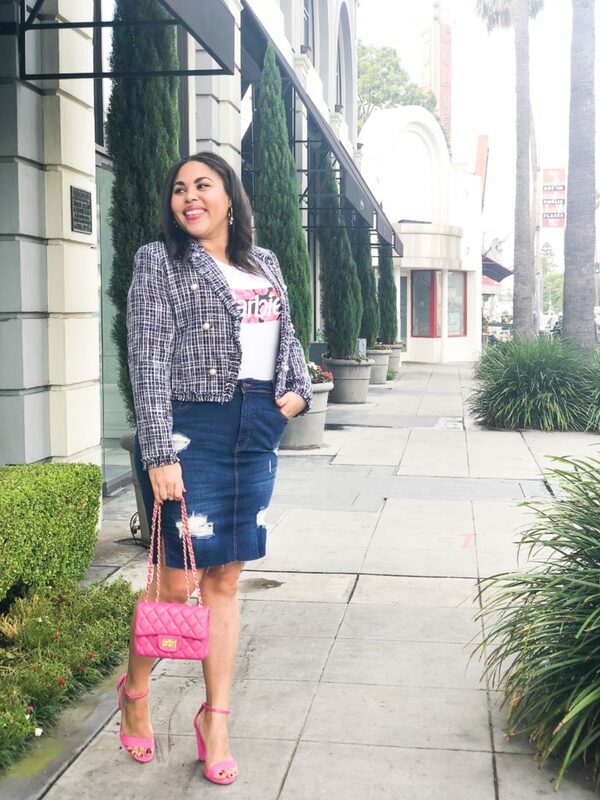 Do you own any tweed pieces in your closet? 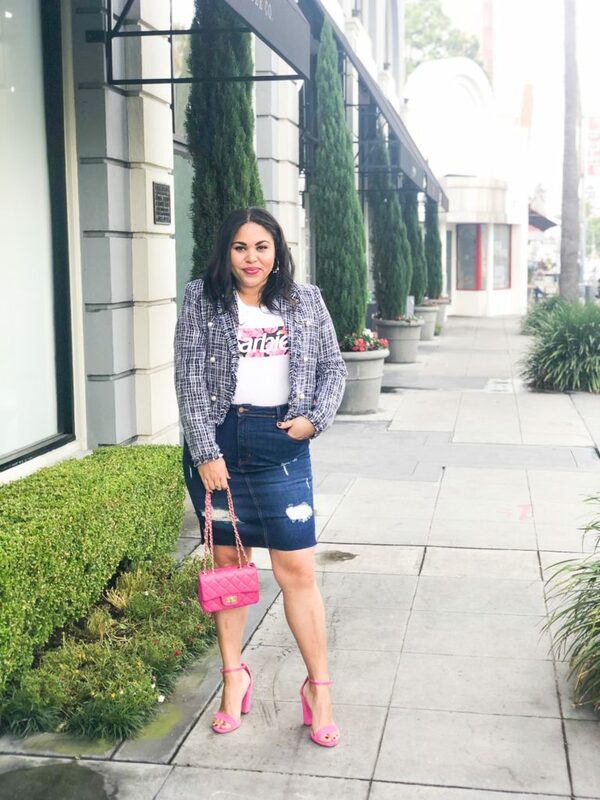 How are you styling them this season? I’d love to hear!